At Fellowship Baptist Church, we take the worship of our Lord and Savior to heart. Our Sunday morning Celebration and Worship service is a blended service combining music, scripture reading, testimonies and preaching of God’s word into one seamless worship experience. The gifts and talents given to Fellowship Baptist through its members allow us to offer a variety of volunteer opportunities in our worship ministry. 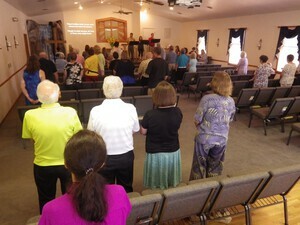 Our Sunday morning services are a blend of contemporary praise songs, and traditional hymns. Our Worship Team is a gifted group dedicated to bringing our church community together through God’s gift of music. The Worship Team is a group of talented musicians whose desire to minister to the congregation as they lift their voice and instruments to the Lord in worship. New vocalist or musicians are encouraged to volunteer to be a part of this important ministry. Sunday Morning services combine multiple elements to bring a robust worship experience. 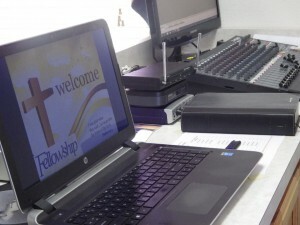 Facilitated by our Media Team, we combine slides, sermon, and music elements to immerse the congregation in praise and worship. The Media Team’s responsibility is to deliver technical expertise that will aid the pastor, worship leaders and Worship Team in delivering high quality audio and visuals. The Media Team rotates Sunday morning responsibilities. New team members are encouraged to volunteer.